Ohio University Press, 9780821421055, 268pp. Gus Reed was a freed slave who traveled north as Sherman’s March was sweeping through Georgia in 1864. His journey ended in Springfield, Illinois, a city undergoing fundamental changes as its white citizens struggled to understand the political, legal, and cultural consequences of emancipation and black citizenship. Reed became known as a petty thief, appearing time and again in the records of the state’s courts and prisons. In late 1877, he burglarized the home of a well-known Springfield attorney—and brother of Abraham Lincoln’s former law partner—a crime for which he was convicted and sentenced to the Illinois State Penitentiary. Reed died at the penitentiary in 1878, shackled to the door of his cell for days with a gag strapped in his mouth. An investigation established that two guards were responsible for the prisoner’s death, but neither they nor the prison warden suffered any penalty. The guards were dismissed, the investigation was closed, and Reed was forgotten. 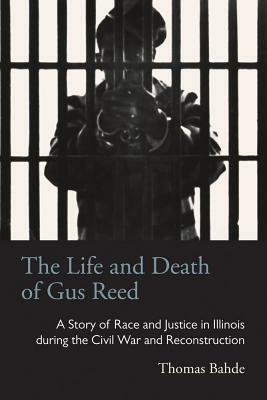 Gus Reed’s story connects the political and legal cultures of white supremacy, black migration and black communities, the Midwest’s experience with the Civil War and Reconstruction, and the resurgence of nationwide opposition to African American civil rights in the late nineteenth century. These experiences shaped a nation with deep and unresolved misgivings about race, as well as distinctive and conflicting ideas about justice and how to achieve it. Thomas Bahde teaches in the School of History, Philosophy, and Religion at Oregon State University. He has authored articles on the midwestern experience during the Civil War and is the editor of The Story of My Campaign: The Civil War Memoir of Captain Francis T. Moore, Second Illinois Cavalry.